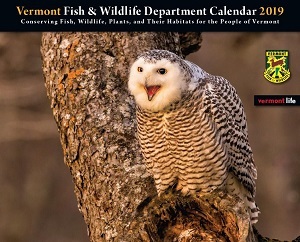 MONTPELIER, Vt. – Vermont Fish & Wildlife Department announces the release of the colorful 2019 Fish & Wildlife Calendar. The calendar is filled with stunning photos of Vermont wildlife, including moose, bald eagle, longnose gar, white-tailed deer, and yellow warbler. It includes photos by many well-known Vermont photographers including Roger Irwin, Jim Block, and Kurt Budliger. The calendar includes hunting, fishing and trapping season dates for each month, along with beautiful photography, and makes the perfect gift for any outdoor recreationist. These calendars usually sell out early, so get your copy today. Following the folding of Vermont Life, calendars are no longer available in stores. They are available online at www.VermontLifeCatalog.com or at Vermont Fish & Wildlife Department offices in Montpelier, St Johnsbury, Springfield, or Essex Junction.